Last night Super Bowl XLIX aired on NBC. It’s not often that the two best teams play against one another, but that’s exactly what happened when the Seattle Seahawks squared off against the New England Patriots for the big game. As it turns out, people were really invested in watching Super Bowl XLIX. Reports indicate that the 2015 Super Bowl earned a 49.2 rating and a 72 percent market share. That latter number means that 72% of all households with TVs in use at the time of the game were tuned in for the Super Bowl. And that’s not even counting the numerous households who streamed the game for free. While ratings for most shows have seen decreases in recent years, football still seems to be going strong. Following big numbers for the college championship this year, the 49.2 rating and 72 percent market share for Super Bowl XLIX happens to be the highest ratings shares the Super Bowl has ever achieved. According to NBC, the previous record went to the Super Bowl game that aired just two years ago, Super Bowl XLVII, which featured the Baltimore Ravens and the San Francisco 49ers. That game earned a 48.1 rating and a 71% market share. Currently the exact number in millions who watched the game hasn’t yet been accumulated, but those numbers are still pretty impressive. Any time a ratings record is broken, it is worth talking about, and I think it speaks to football’s popularity that both the Super Bowl and the College Football championship pulled in incredible ratings this year (although the latter had the added benefit of being a new and highly anticipated event). Of course, in the Super Bowl’s case, people weren’t simply tuning in to see two teams filled with dudes in pads trying to run a ball down the field. 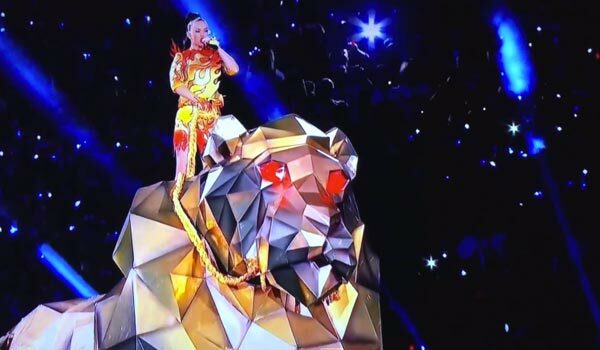 A lot of people tuned in to catch Katy Perry’s halftime show, which included an epic entrance that needs to be seen to be believed. Additionally, plenty of people tuned in for commercials. Some featured celebrity and pop culture cameos, including appearances from Mindy Kaling, Kim Kardashian and even the Breaking Bad character Walter White. Others went for the cute factor, like the Budweiser commercial, or the funny factor, including the Liam Neeson Clash of Clans commercial. Between one of the greatest on-field games in the event's history, some fun commercials and an interesting halftime show, there was a lot to look forward to with Super Bowl XLIX. It's easy to see why good ratings were huge, and apart from New England Patriots fans, it's likely no one is happier today than NBC.